The Himalayan metal and the quartz crystal singing bowls weave a tapestry of sound that offer a memorable experience that can restore, inspire and enhance a deep sense of wellbeing. The singing bowls are a type of bell, called a standing bell. Rather than hanging inverted or attached to a handle that we are accustomed to seeing with bells, the singing bowls rest on their bottom surfaces when played. In the challenges of daily life, one may encounter circumstances that generate stressful responses on the physical, mental or emotional levels. Techniques, such as guided imagery, meditation, prayer and breathing exercises are utilized to release stress and tension. 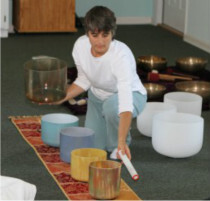 A singing bowls concert can also offer a positive, non-invasive way to create a deeply relaxed and peaceful state. It is easy and simple, all one has to do is listen and enjoy. When the bowls are played, one is immersed in beautiful sound as the soothing tones flow thru all the senses. This application of sound can have a relaxing effect as the stress cycle is broken and tension melts away. Relaxation is brought forth by the restorative resonances of the bowls.